For any fitness trainer or coach, there comes a sense of pride and responsibility as you train your clients. But when you are training two pregnant gold medal Olympians and one is your wife and the other is your sister-in-law, the feeling is all the more special. 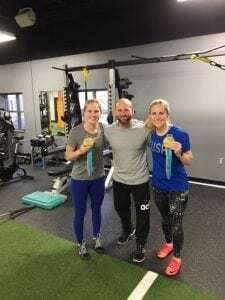 Anthony Marc Morando is married to U.S. Olympic women’s ice hockey player and gold medalist Monique Lamoureux-Morando and has been the fitness trainer to her and her twin sister and fellow teammate, Jocelyne Lamoureux-Davidson, for more than four years. When it comes to pregnancy and fitness, there is often a back and forth as to what and when it is safe to work out, but as strength and conditioning trainer and manager of human performance at Altru Health System, Morando attests there’s no wrong time to start working out. More so, pregnancy is the perfect time for women of all fitness levels to start investing in their physical health through implementing a proper workout regimen. When it comes to prenatal fitness, Morando explains that generally there are two ends of the spectrum: someone who is really fit and becomes pregnant, and someone who is more sedentary, not as fit, and becomes pregnant. 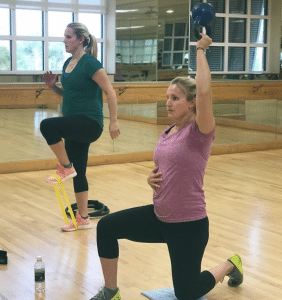 For the pregnant and fit athlete, the trick is bringing their fitness routine from the intense end of the scale back to the middle. On the other hand, for a less fit pregnant woman, the key is to help bring them from a sedentary end of the scale to the middle as well. The key is finding a safe balance of fitness either way, the only difference is having two different starting points. “You have to create balance in both their lives. It’s not going to hurt a pregnant woman who isn’t fit to become more fit. And the weekend warrior who wants to keep pounding the rock—she needs to take it down a notch so she doesn’t compromise herself and the baby,” Morando says. As a Manager of Human Performance, Morando reveals that regardless of a woman’s level of fitness during pregnancy, the biggest challenge is something beyond deadlifts and cardio, and is the key to successfully training them. The psychological stressors that affect pregnant women is the biggest challenge when it comes to fitness routines. Morando explains that a trainer can have all the data and game plans in the world but when it comes to pregnancy, it’s all by feel and constant communication. Upgrades and modifications are necessary in a fitness program to ensure safety and a feeling of comfortability. Whether you’re an Olympic athlete or use your at-home treadmill to sort laundry, when it comes to creating a fitness routine during pregnancy, there will be days when you just want to go for a walk or days when you can do two sets of 10 as opposed to four sets of 10. Acknowledging what the body’s needs, realizing capabilities will shift throughout the journey, and being able to adapt to the psychological stressors that arise during pregnancy are essential in order to achieve the optimal training solutions. During pregnancy, the female body undergoes a variety of remarkable biological and physical changes that can affect the psyche and fitness performance. Keeping in tune to the body’s needs and making proper modifications when it comes to specific exercises is key to ensuring that no harm is done. While psychological factors are an obvious difference from pre-pregnancy to pregnancy, overall, when it comes to physical training, Morando is striving to break the molds of male and female fitness perception. When it comes to Morando’s training techniques for his wife and sister-in-law, the athletic mindset has shifted. For these two Olympians who typically train for a game day that involves a gold medal in February, their game day now is labor. Preparing for this event means tightening the abdominal muscles, initiating stabilization of the spine, and practicing a lot of exhalations. “We want to create strong stabilizers. Your abdomen is meant to store, transfer and brace when it comes to energy, so we don’t want to flex and extend the spine. Instead, we want to plank, and we want to put pregnant women in standing positions to make sure we don’t compromise their pelvis or the baby. “You want to avoid movements that involve getting up and down quickly. I can’t stand burpees. I think it’s probably one of the worst exercises ever given. It’s degrading to the body because of how much damage it can do. The bigger the belly gets, the more awkward the movement becomes, and mom is going to get frustrated if things feel awkward. You can do a lot of other exercises to increase the heart rate moderately and give them the feel of what a burpee would be like without flexing the spine and potentially damaging their hips. “A good alternative to intense cardio that we do is prone hip flexion or a push-up to hip flexion. This is done in a push-up position and includes bringing the knee to the chest. Other things you can do are march in place for 30 seconds or slamming a medicine ball. Basically, moves that require either a standing position or where the hands are elevated so the spine and hips aren’t compromised. If you really want to feel that burn, then that’s where exercise bikes, versa climbers and non-frictional machinery come in. “To wind down, while we tend to do more core strengthening and shoulder strengthening, we also do some foam rolling to continue blood flow and to create a quality fascia line [connective tissue structures between muscles]or better quality of movement in the muscle. “Sitting and standing are best. Standing is great because you can do so much from a standing position. Pregnant women can squat. Pregnant women can do high surface deadlifts. They can also get core work standing and carrying something. If they breathe normally, they will feel well and the best position for that is when they’re standing up. Balance is another deal. One leg holds, unilateral holds, holding for three sets of 10 seconds, or one longer 30 second hold all work great. And if you feel wobbly during these, then hold something for support, but remain on one leg to build stability. As Morando continues to strive to educate women that pregnancy is the perfect time to strive for a healthy body, he gets closer and closer to adding a new title to his list of accomplishments: coach, trainer, husband and soon, dad. Until then, he continues to train his Olympian family during their pregnancies. Anthony Marc Morando graduated from Springfield College with a bachelor’s degree in applied exercise science. He is a certified strength and conditioning specialist and holds certifications from the Collegiate Strength and Conditioning Coaches Association and in functional movement systems, TRX and CFSC. 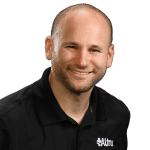 He is the former strength and conditioning coach for the men’s and women’s hockey programs at the University of Minnesota Duluth and the men’s hockey program at Boston University. He is currently the manager of human performance at Altru Health System, powered by EXOS.